Already without Matt Nieto and Tyler Kennedy, the Sharks’ suffered two more injuries in their 5-2 win over the Edmonton Oilers on Tuesday. Marc-Edouard Vlasic missed the last two periods for precautionary reasons according to Sharks head coach Todd McLellan and fourth liner Mike Brown looks to be out “awhile” after awkwardly crashing into the boards. 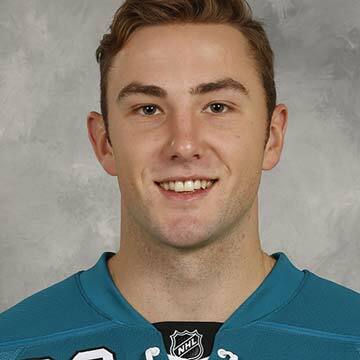 Skating with just five defenseman and 11 forwards for a lengthy portion of the game, the short-handed Sharks got a terrific showing from rookie winger Barclay Goodrow. Not only did Goodrow notch his first career NHL goal, but he also stepped up in more ways than one with the team down a man. The 21-year-old rookie has seen only an average of 19 seconds on the penalty kill this season but McLellan seems to trust him more and more in that role. Against Edmonton, he nearly got another short-handed assist and was sound positionally in his own zone. On the previous home-stand Goodrow picked up a short-handed assist, making a nice pass across right on the tape of Tommy Wingels. With his first career goal on Tuesday, Goodrow now has three points in 14 games thus far during his rookie season. While he hasn’t shown much offensive flare, he has used his above average speed and strong defensive awareness to be a valuable contributor when called upon. The Ontario native reflected on his first goal after the win. Will Goodrow Continue to Grow? For the game, Goodrow skated 15:07, with two shots on goal and finished plus-1. Obviously younger and a bit smaller, his play style reminds a bit of former Shark Mike Grier. He has good speed, strong on the penalty kill, smart in his own zone, and also like Grier, he doesn’t exactly shoot like Patrick Marleau. With the various injuries at wing and Brent Burns playing defense this season, the Sharks are looking for some wingers to step up. Goodrow has been one of a handful of guys in and out of the lineup thus far this season. Hopefully for the Sharks, confidence from scoring his first goal will carry over to sustained strong play. At least for one night he looked sharp, and his goaltender was quite appreciative. The win over the Oilers was the Sharks 30th game of the season, but just Goodrow’s 14th on the year. Despite shining in training camp on an all rookie like with Chris Tierney and Nikolay Goldobin, an injury set him back to start the season. The undrafted free agent acquisition didn’t play his first game until the Sharks’ 12th game of the year on Oct. 30th in Minnesota. He has since played in 14 out of San Jose’s last 19 games, at times being a healthy scratch. He didn’t play versus Anaheim nor Philadelphia on the prior home-stand. Instead he sat in the press box while tough guys John Scott and Mike Brown played over him. Neither Brown nor Scott spend any time on the penalty kill. It is certainly curious why Goodrow hasn’t been getting more game action ahead of these two. He provides so much more at both ends and on special teams. With Brown’s injury putting him out for “awhile” according to McLellan, perhaps the Sharks look to ice a more skilled fourth line in the near future and return Scott to the press box. When Nieto and Kennedy return, Goodrow certainly is a better fourth line option than Scott.